A royal destination wedding held at Noor Us Sabah and Jehan Numa Palace, Bhopal – Deepali and Devesh brought their worlds together in one tastefully grand wedding held at this regal wedding location. Bhopal being a matriarchy, Noor Us Sabah was constructed in the 18th century by Sutal Kaikhusrau Jahan Begum for her daughter, and now is a stunning heritage hotel, perfect for a royal destination wedding. Walking through the corridors, of both the palaces gives one an insight to the beautiful stories of women rulers – a perfect royal-esque vibe created for Deepali and Devesh’s Noor Us Sabah Palace destination wedding beautifully captured by Mumbai's most sought after photographers The Wedding Salad. The day began on an extermely auspicious note with a pooja conducted by Devesh’s parents in a nearby temple which had a charmingly antiquated, rural setup, fully rustic, while on the other side at Jehan Numa Palace, Deepali’s intimate haldi was being held. After which, Deepali’s Mehendi celebrations brought on an attendance of most participating, beautiful guest, at Jehan Numa Palace, Bhopal. Her bright and bold mehndi ceremony lived up to its old world feel as intended by Devesh and Deepali.Seating arrangements in concentric circles, bright drapes hung in the open with white and yellow gaddi’s and cushions and an abundance of marigold flowers! All of this set at the gorgeous Jehan Numa Palace – it was a picture perfect set up. As Deepali, got ready for her big day in a stunning pink Anita Dongre saree, she had a world of emotions running through her. Playful yet nervous – as any bride would be. seemingly very playful, Her beautiful polki and gemstone studded jewellery, designed by her father brought in the perfect amount of elegance to her entire bridal ensemble. 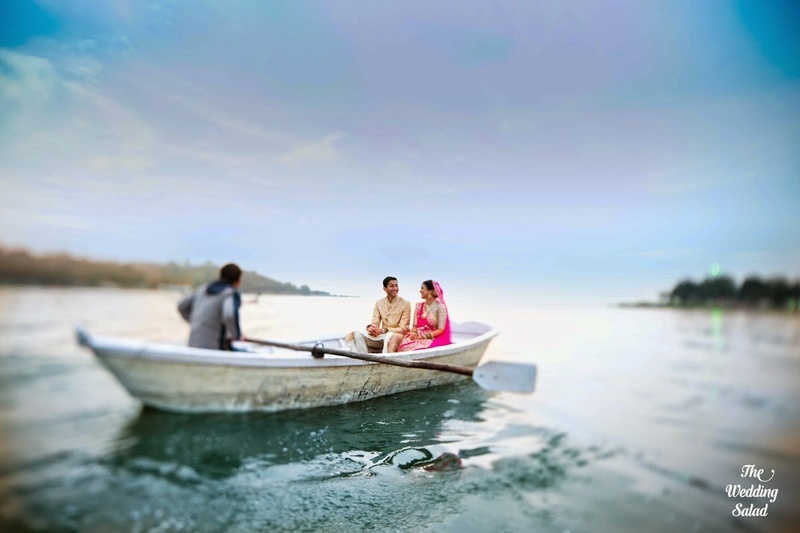 Their wedding was held at day-time on a lawn overlooking the whole of Bhopal and Vindhya hills, with a breath-taking view of Noor Us Sabah Palace, Bhopal. In traditional North Indian weddings the Baraat is a jolly bunch, with loads of naach-gaana and loud dholaks. They usually take their own eons to arrive at the wedding venue. But, Deepali and Devesh had planned their wedding in such a way that the baraat wouldn’t hold up any of the wedding ceremonies and hence decided to have the baraat show off their dancing skills on the way to the wedding reception. But this wasn’t your usual baraat, musicians playing the bagpiper, shehenai and dhol altogether created a fun vibe as the grooms side danced toward the wedding venue.Deepali and Devesh opted to have their wedding ceremony in the most elaborate, detailed way and in its truest sense, in the most meaningful way. Their pandit, interestingly an IIT alumni had manuals which outline equal duties of a husband and wife without any prejudices – taking traditional Indian wedding rituals to another level of beauty.